Pan Roasted Chicken Breast, moist every time! In a high-rimmed sautee pan, heat coconut oil on high and place chicken breasts in hot oil, salt, pepper and brown each side until crispy and golden, but still very pink inside. Reduce heat to medium and flip once more, then add water and cover quickly, allowing for chicken to steam. Turn off heat and let sit for 10 minutes – for thicker breasts such as 10 – 12 oz allow for 15 to 17 minutes. Note: Once you cover the chicken – DON’T uncover the pan, as you’ll lose all the valuable steam which will allow for the chicken to be oh so moist! 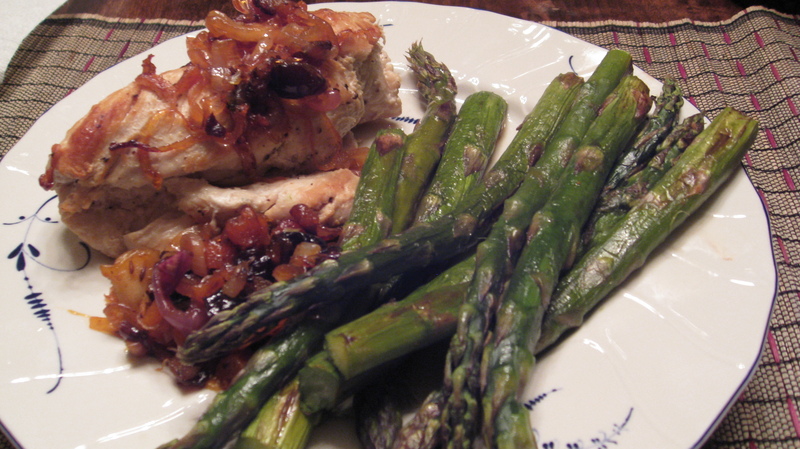 Top with my Dried Apricot and Prune Sautee and serve with some oven baked Asparagus!